"Taskmaster has the extraordinary ability to perfectly replicate any physical performance he has ever seen. He watched a professional football game? Now he can throw like a star quarterback. He saw Captain America on the news? Now he can mimic his combat style flawlessly. In Marvel Puzzle Quest, Taskmaster spends his time carefully observing other characters and learning how to use their powers. 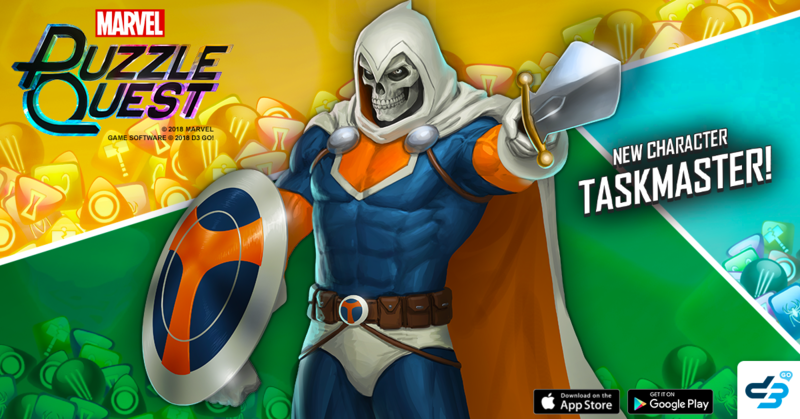 Explore Taskmaster's Power Details page to choose which powers he should use in battle." Check out the brand new 4-Star Taskmaster, and find out how you can recruit him onto your team! Choose one of the following six abilities for Taskmaster to take into battle! Everyone's wasting their time punching each other, but Taskmaster takes a cue from Deadpool and cuts straight to the chase. Taskmaster slices the enemy with his sword, dealing 40% of their current health in damage (maximum 5531 damage). Taskmaster points past his enemy and shouts "Hey! Is that Big Wheel?" before swinging in with a sucker-punch. Taskmaster deals 2739 damage. He deals an additional 1157 damage per friendly Countdown tile (up to 6). Taskmaster lashes out with dual blades, attacking his enemies' weak points. Deals 2434 damage, then creates 2 strength 199 Red Attack tiles for every 3 Green AP his team has. Taskmaster hurls his osmium shield into battle. Hits the target for 5311 damage and transforms any chosen tile into a Red 3-turn Countdown tile that returns 6 Red AP. Taskmaster lobs a grenade towards his opponent and quickly draws his weapon, putting the grenade in his sights. Creates a 4-turn Red Countdown tile that deals 10912 damage. If you match it away, deal 15457 damage instead. Taskmaster doesn't have time for all this nonsense. Give these knick-knack-paddy-whacks what for! Deals 9836 damage, or 15742 damage if there are no enemy Strike, Protect, or Attack tiles on the board. Taskmaster nocks multiple arrows and lets them fly. Whenever his team makes a Match-5 or greater, converts up to 4 Blue tiles to 2-turn Countdown tiles that deal 1467 damage when activated. Taskmaster ricochets a billy club from target to target, striking his enemies with amazing accuracy. Stuns the target for 2 turns and creates a 3-turn Blue Countdown tile that stuns for 2 turns and creates a new Billy Club Countdown tile. If you match it away, he catches the club and gains 3 Blue AP. Taskmaster leaps onto unsuspecting enemies from the trees in an unrelenting assault of tooth and nail. Deals 4328 damage to the enemy plus 810 damage for each enemy Protect, Attack, or Strike tile on the board (up to 8 tiles). Taskmaster lands a direct hit with his shield, disabling the enemy team and helping his allies get the drop on their target. Stuns all enemies but the target for 3 turns and places one 3-turn Blue Countdown tile (that deals 5796 damage) for each active ally. Taskmaster doesn't futz around. Deals 9925 damage and creates a 5-turn Countdown tile. While this tile is on the board, enemies cannot gain health. Taskmaster mercilessly makes a precision slash with his sword, dealing a crippling blow to his enemy. Deals 3221 damage to the target, and then creates a Green Repeater tile that activates every turn, stealing 1 AP from the enemy's strongest color. Taskmaster senses an attack coming and prepares to dodge into the shadows. He converts 5 random basic Black tiles into Trap tiles. If Taskmaster would take damage, the damage is negated and a Trap tile is destroyed, generating AP and dealing 920 damage. Taskmaster grabs two of his enemies and smashes their heads together before throwing them into a third enemy. Taskmaster deals 2652 damage to the enemy team, and then stuns up to 2 random enemies for 2 turns. Taskmaster flings a handful of razor-sharp blades at his enemies, combining deadly precision with wild abandon. Deals 12881 damage to a random enemy. Stay tuned! His full Character Details are coming soon. Rewards tokens to Strange Sights, random cover of Taskmaster (Tony Masters), and more!